If you've been adding more natural and organic beauty products to your life, I have a wonderful Natural Toothpaste that offers superior whitening and great taste..
Tom's of Maine Luminous White Clean Mint Natural Toothpaste claims to get teeth white in 2 weeks with regular daily use. I have to say, I was very impressed with the cleansing and whitening effects, as well as the fresh and natural taste. Luminous White Clean Mint Natural Toothpaste is Tom's of Maine most advanced whitening toothpaste, which uses natural technology to remove surface stains, while still being safe on enamel. The first thing that stood apart was the very fresh and indeed "clean" flavor of the Luminous White Clean Mint Natural Toothpaste. It was unlike any other flavor I've experienced, especially from the bigger, mainstream toothpaste brands. It was as if real, gently pressed mint leaves were on the brush - fantastic! As far as the texture/weight of the paste, this was also different. 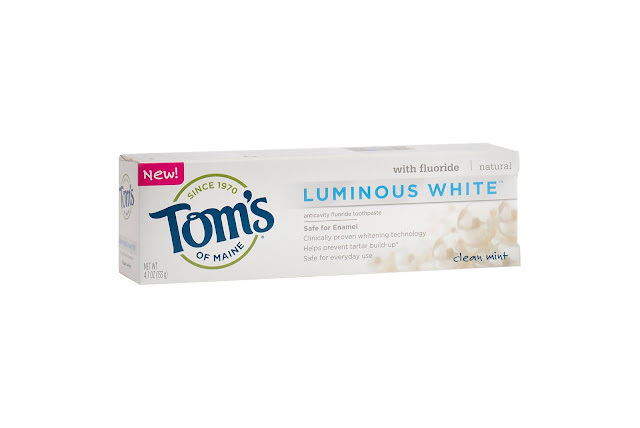 Tom's of Maine Luminous White Clean Mint Natural Toothpaste was softer and slightly more liquidy than mainstream toothpaste. While my teeth are fairly white, I do drink coffee and sometimes darker wine, so I was happy when I could, in fact, see that after a few weeks, my teeth were brighter. I love that Luminous White Clean Mint Natural Toothpaste also has all important fluoride, as well as Xylitol, for naturally fresh breath. It also provides Tartar control. This was my first time using a Tom's of Maine toothpaste and I appreciate the naturally sourced formula and the visible whitening results. I also loved how fresh and clean my mouth felt after rinsing. *This product was provided courtesy of Tom's of Main PR for reviewing purposes.